For a considerable time, Oddington P.C.C. had been searching for a vestment chest to replace one that had, for many years, been in the church tower but was falling apart. Regular viewing of the Church Times had not found anything, nor had visits to local antique dealers. The Revd. 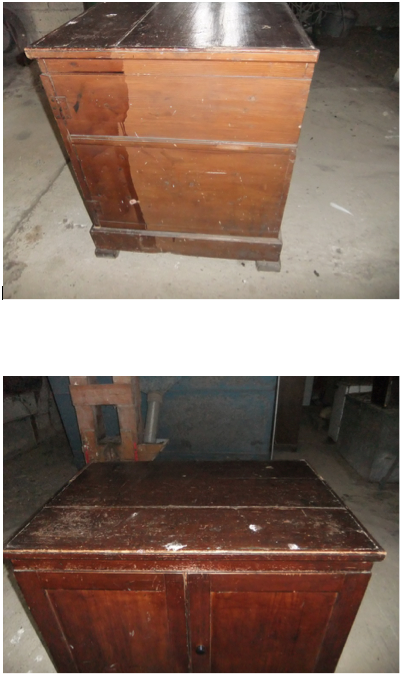 Andrew Rycraft suggested looking on e-bay for a planner’s chest, being the closest he had found to a vestment chest. Churchwarden Nigel Lambert spent many hours pursuing planner’s chests on e-bay, only to be outbid by people willing to pay many hundreds of pounds. On the verge of giving up he made a last search for “vestment chest”, and up one popped! It was offered for sale by a dealer from Antos Gowt, Boston, Lincolnshire. Nigel phoned and made an offer of £200. To his amazement, a few hours later his offer was accepted. Now Nigel faced the problem of how to get the chest from Lincolnshire. He spoke to the dealer who offered to put him in touch with a carrier he used. In due course the carrier phoned to arrange the date for delivery. It arrived on a Sunday morning, when, as usual, Nigel was away running. His wife Margaret was left to deal with the matter. A van arrived, driven by a young man, accompanied by his heavily pregnant wife. The van had been loaded by someone else and the weight of the chest came as a big surprise. It was off-loaded and the three people carried it into the churchyard and deposited it in the porch. The charge for the delivery was £40! 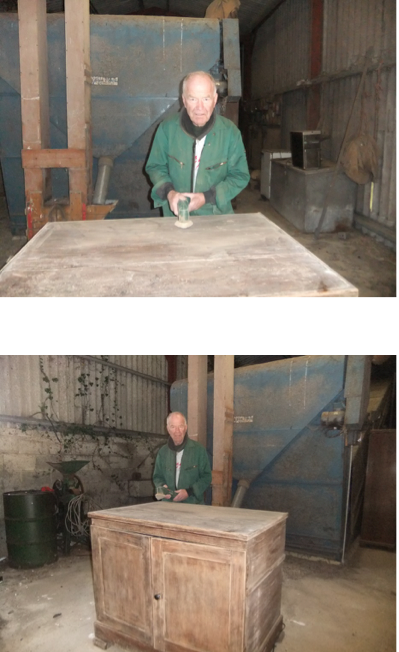 Nigel’s plan was to get the chest into the vestry, where he would restore it. He sought out his nephew, Neil Lambert, to ask if he would join a working party to lift the chest over the pews and into the vestry. Neil suggested that to restore it in the church would create a lot of dust and it would be better to remove it to the farm buildings opposite. He said, “Leave it to me” and an hour later it had gone. Neil had found willing helpers and quietly done the job. 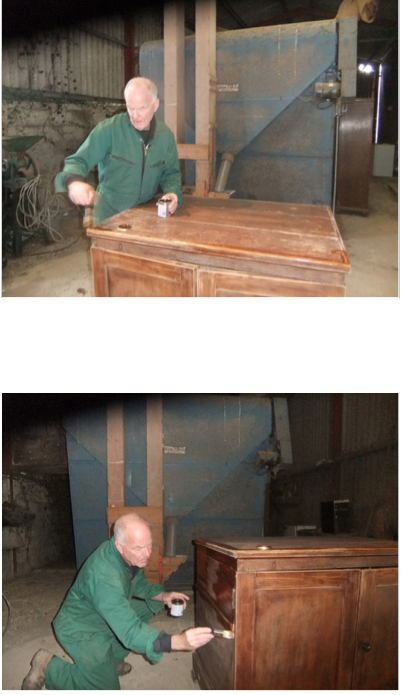 The dealer had given advice on how to restore the chest and Nigel, not one of nature’s craftsmen, set about the task. 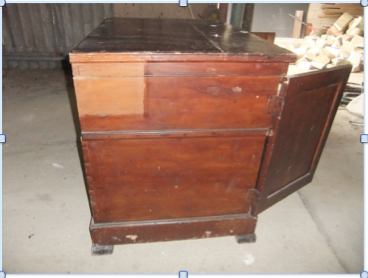 The chest was in generally good condition but had been stained whilst still in situ in a previous church. This resulted in different shades on the sides, where it had been up against a wall and a large safe. It was sanded down and a number of coats of wood stain applied. 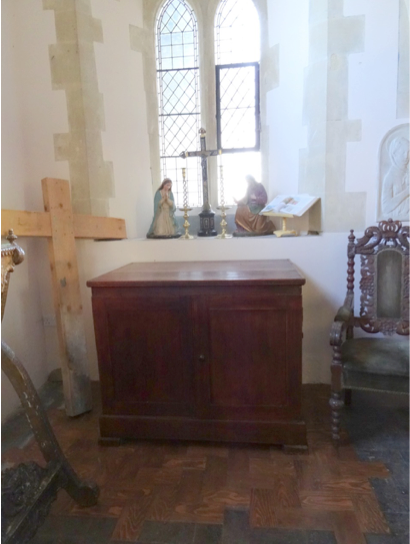 The restoration complete, it only remained for the chest to be put in place in the vestry. Not a simple task as it meant lifting it high over the pews, needing four strong men. Nigel again approached Neil to ask if he would be in a working party. Within days the chest has miraculously appeared in the vestry, Neil having commandeered the services of friends. To complete the story, Nigel contacted the dealer, Margaret Grubb, to ascertain if she knew where the chest had come from. Helpful as ever, Margaret came back to say it had come from the Roman Catholic Church of Our Lady Mount Carmel, Corby Glen, Lincolnshire. The church was erected in 1855-56, having been moved stone by stone from the nearby Irnham Estate. It was closed in 2012 and has since then been on the market.